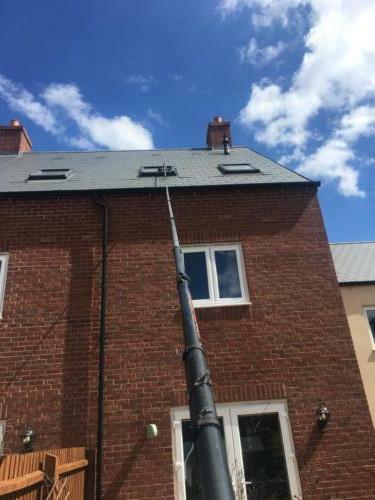 Bedford Window Cleaning does not have a "One-Size" fits all approach, we tailor the clean to suit the customers needs, we understand that not everyone wants a window cleaner that just visits your area when ever it suits them. We offer our cleaning services on a regular basis at a frequency that suits you. We have an advanced scheduling system called Jobber that we use to plan all of our visits, when you request a quote through our website it comes directly into Jobber and then is assigned to one of our team who will provide you with a quote. Pricing depends on the size of and access to the property. 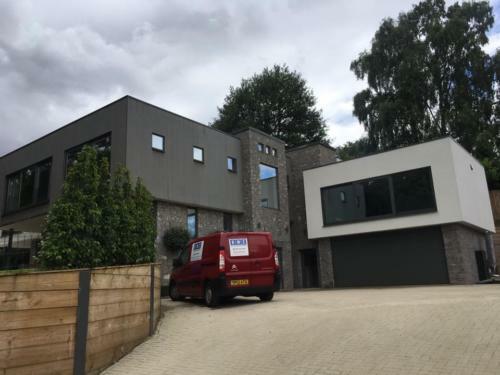 You will receive your quote via email, and if you decide to go ahead you approve it straight away by clicking the link or if you need to make changes we will be happy to assist. Once you're happy with our quote all that is left is for us to get that first visit booked in, once we have converted your work request to a job, we will contact you via Phone, Text or Email, to arrange when is best to visit. Want to know when we are due to visit? 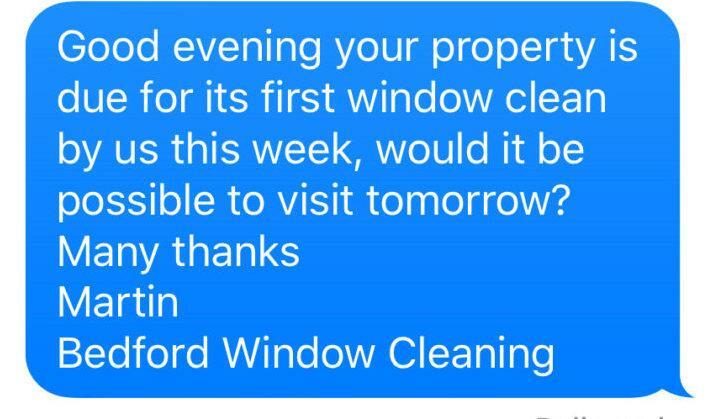 We offer a complimentary Text the night before service to all our customers, so you know we are visiting your property. This allows you to know your windows are due to be cleaned and arrange a suitable time for us to visit. 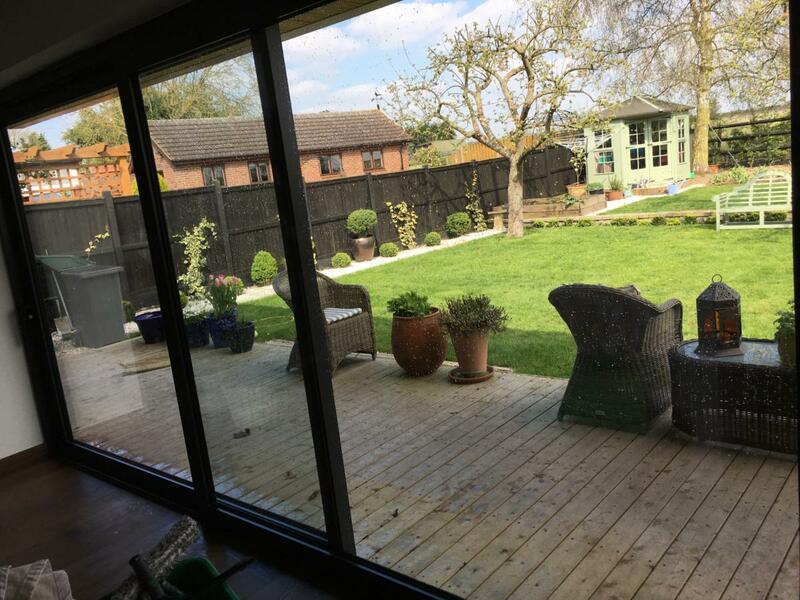 How Bedford Window Cleaning do the first clean on your property. 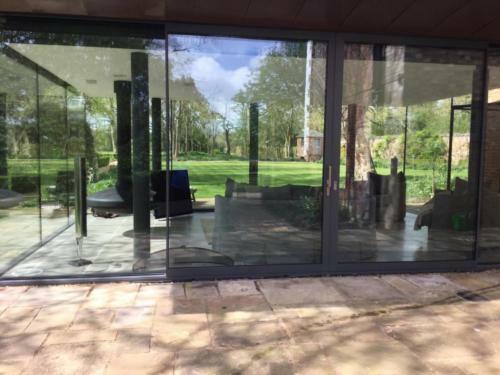 We start our cleaning process with de-cobwebbing all your windows, frames doors, then we scrub all the window, frames, doors and sills to clean off any dirt and marks, following this we rinse all the frames and windows to remove any dirty water. 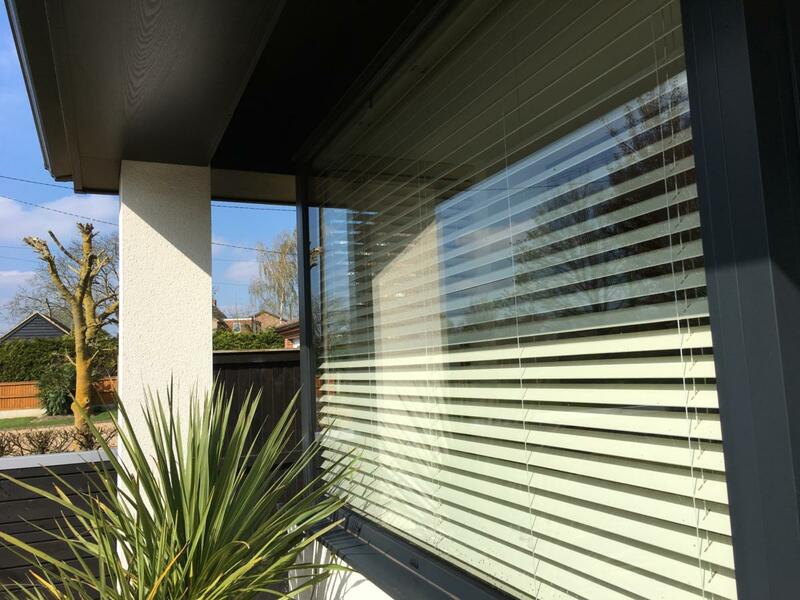 Finally after this first cleaning process, we start again with a second clean to ensure that your windows are left immaculate. We use pure water-fed poles to do our cleaning, and following our tired and tested methodical cleaning method we have cleaned property’s across Bedfordshire, achieving first class results every time. Why your windows are left wet after we visit. As we use pure water to clean your window after we have scrubbed to agitate all the dirt into solution, we rinse all this dirty water off the glass leaving behind no dirt. 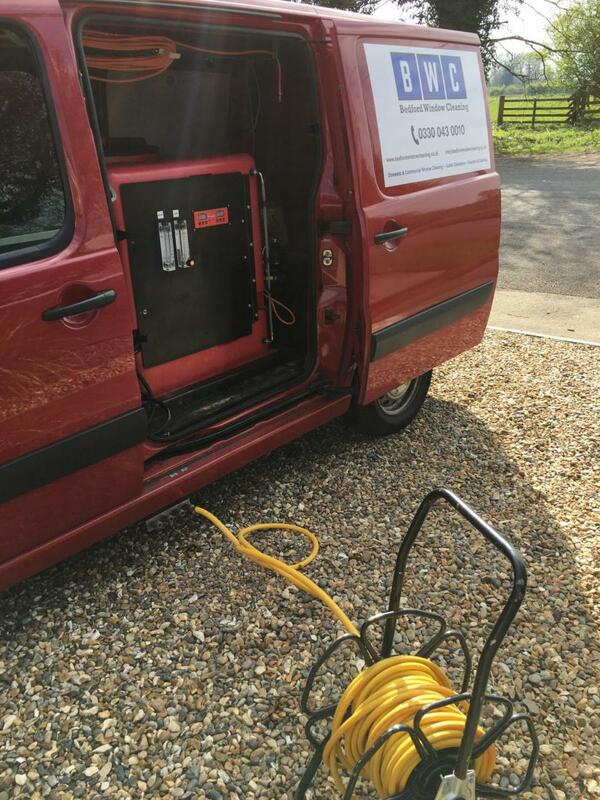 All that is left is droplets of pure de-ionised water this has absolutely zero impurity's or minerals in it, our water reads 000 on a Total Dissolved Solids meter (TDS), As we produce all our own water in house we can be sure of the quality all the time. The pure water droplets will dry without leaving any water spots on the glass therefore there is no need for us or you to dry the glass. How long will my windows stay clean using this method? By using pure de-ionised water to clean your windows we require no chemicals to break down the dirt, the pure water its-self is the cleaning agent, as in production it is given a negatively charged state by the de-ionised resin, the dirt is attracted to the water. 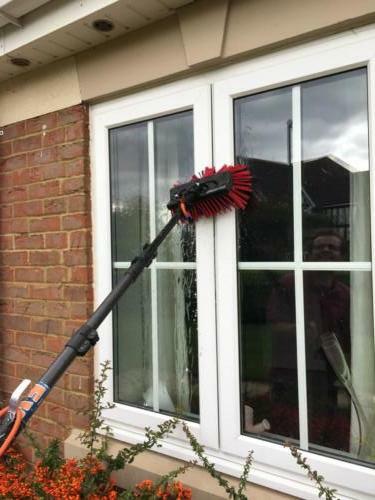 This compared to traditional window cleaning using a squeegee and an applicator, there will always be a thin film of the cleaning agent left on the glass, this attracts dirt. Therefore your windows will, in our experience stay cleaner for longer, how long will depend on the environment around your property, but most of our customers have found that by having there windows cleaned by us with pure water, that they can switch from 4 weekly visits, they were having with their traditional window cleaner to 6 or 8 weekly visits from us. If your unsure how often you would like us to visit ask one of our team and we will give our expert advice based on your location. If you choose to arrange a regular service with us you can choose the frequency at which we visit, we recommend that that you go for a 4, 6, 8 or 12 weekly service but if that does not suit your needs then we will be happy to organise our visits to suit your needs. We do not charge extra for our first visit for regular customers. 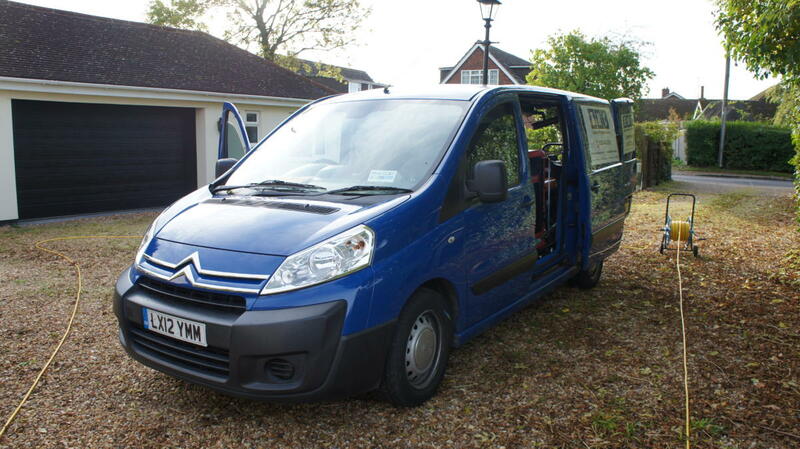 Our regular service runs like clockwork, once you set the frequency at which you want us to visit, our scheduling system notifies us when you're next due and then we get in contact to arrange our visit. The First clean, on our initial visit we will clean all your windows, frames and sills twice to bring it up to our high standards. 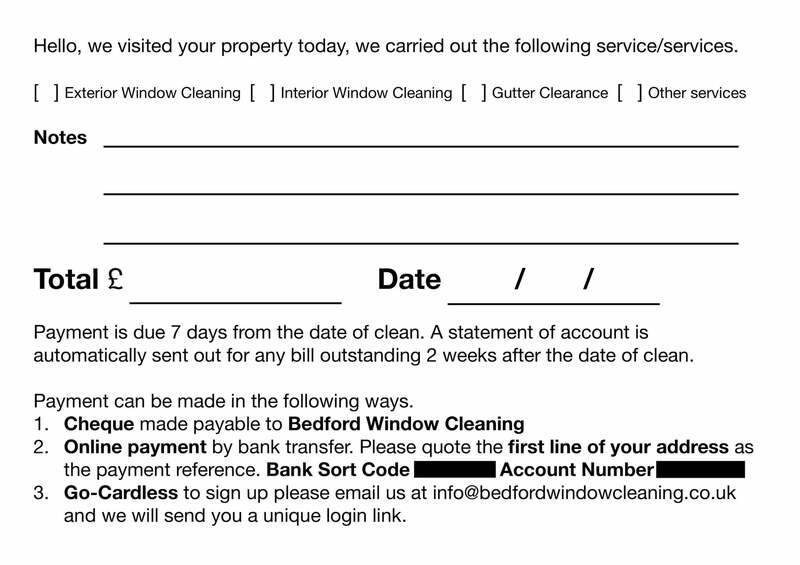 Then once finished we will leave our invoice card which details all our payment methods. 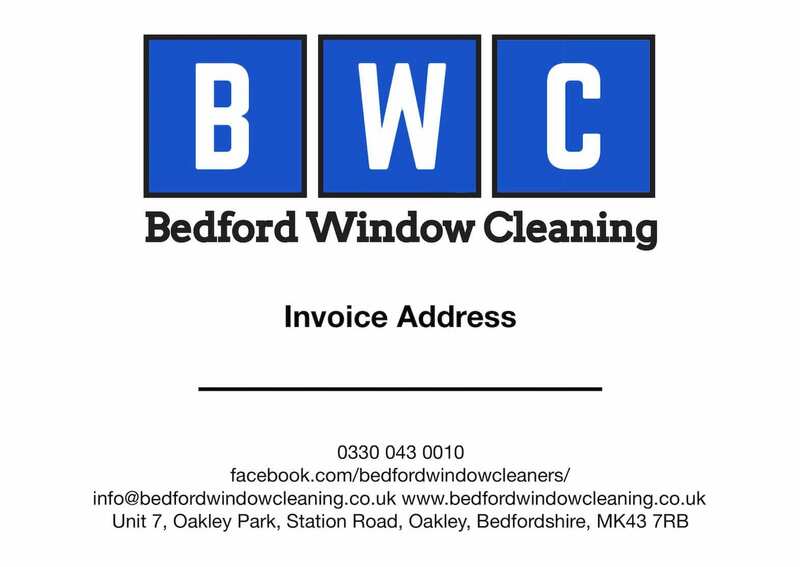 Cheque made payable to Bedford Window Cleaning via post or on the day of visit. Please note that payment is to be made within 5 Working days, after 14 days a statement of account will automatically be sent. One-Off service, if you only need to use our services once, please be aware that this will cost extra compared to a regular service as our first visit takes far longer than a normal clean. However if you decide to continue using our services we will discount your second clean if this second clean is within 12 weeks of your initial visit. 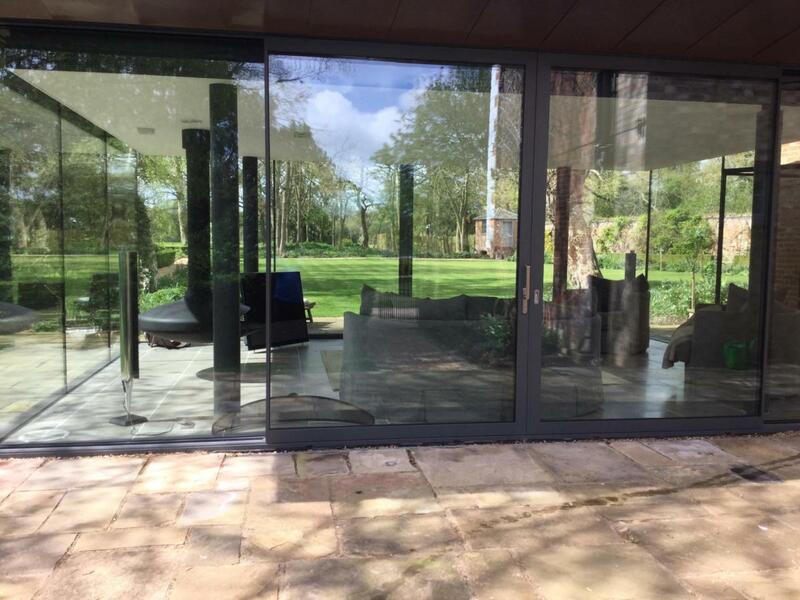 Our One-Off service is a deep clean of all the windows frames and sills this is the same as the first clean service we do for new regular customers. Payment for One-Off services is required on the day, before we leave your property. Very reliable and quality window cleaning service which I have been using for several years now and would recommend. Started using this company after being let down by a previous provider. 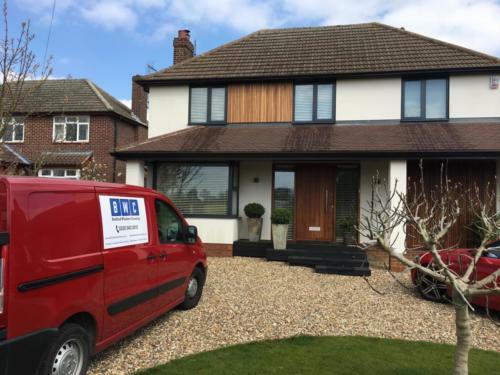 Can't fault them, whatever they promise to do they deliver, they arrive on time, do a great job and leave our windows, frames and window sills looking like new. Excellent business and excellent service, can't recommend them enough.